First, you should either drain your coolant, or be ready to plug up your coolant hoses going to the stock oil cooler. 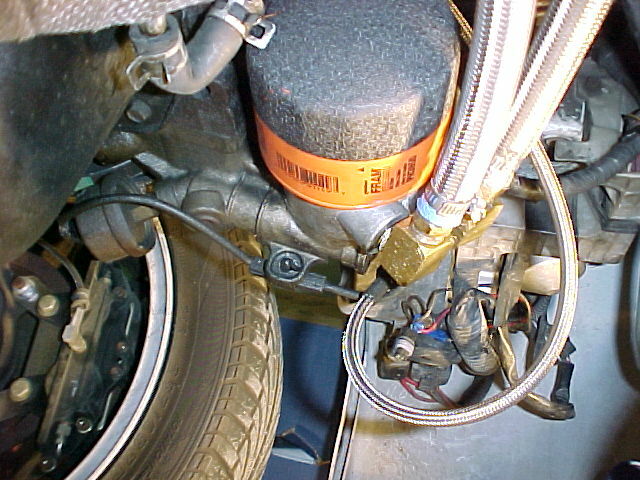 Now you can unplug the coolant lines from the stock oil cooler, and find some way to block them up. I used a metal pipe to form a bypass for where the stock oil cooler used to be, so the coolant flow has the same path as stock. Next, remove the stock sandwich adapter. The stock coolant based oil cooler is sandwiched between the block and the oil filter by a long bolt, so all you have to do is unscrew that bolt, remove the stock oil cooler, and stick your Derale thermostatically controlled sandwich adapter in its place. Screw the stock bolt right back into place. Since the sandwich adapter is the exact same width as the stock oil cooler, the stock bolt should fit perfectly. 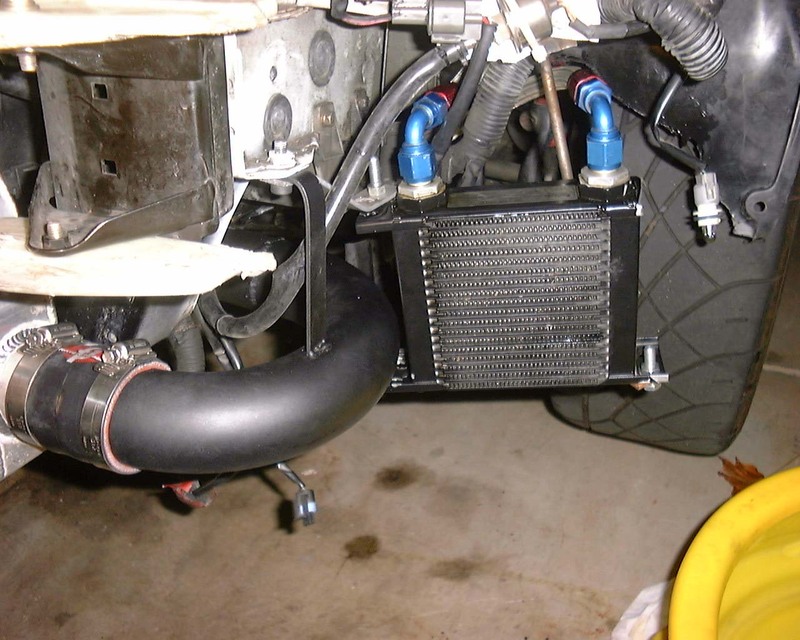 You can then use the supplied barb fittings with AN-8 Aeroquip hose (no messing with expensive/fragile aluminum fittings), and mount the oil cooler whereever you see fit. In these pictures my oil cooler is where the stock sidemount used to be, although I've since moved it near the ABS unit on the driver's side. 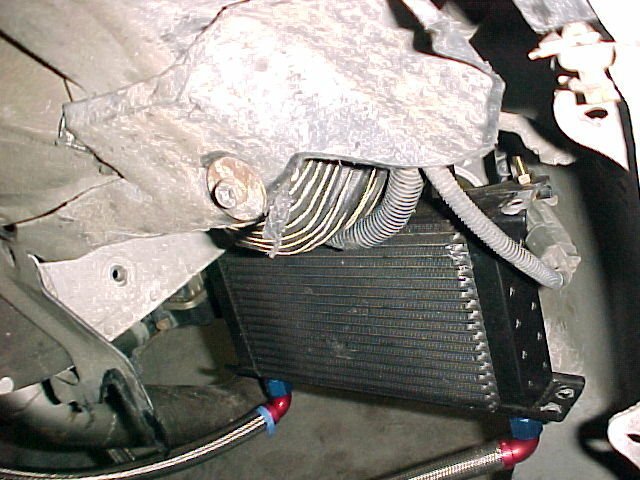 Once the oil cooler is mounted, run your lines to the oil cooler, trim them to the appropriate length, and mount things up. You'll need to use a WIDER oil filter, as the sandwich adapter outlet is bigger. 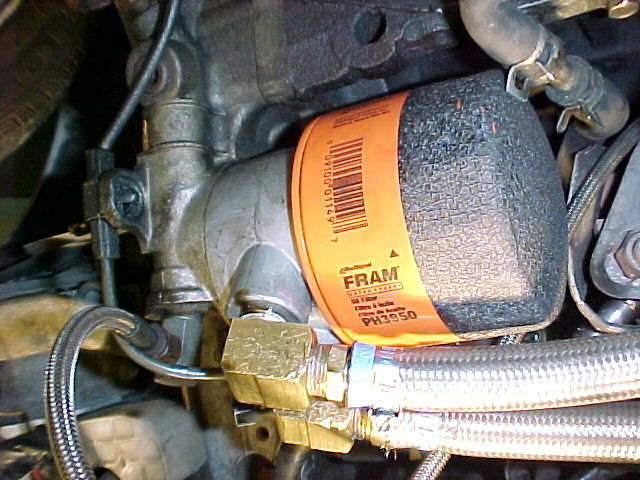 I used the Fram FM3950 oil filter, which fits perfectly. Theoretically any dsm big filter will work (91 and earlier), which includes: FRAM 3950, TVI V-193, Purolator L10193, Wix 51381, Casite CF-2856, Hastings LF-144, Champ labs PH-2809/2810. However, I tried the WIX 51381 on my car and the gasket was too small and thus leaked, even though the filter itself was the same size. Try non-fram filters at your own risk (wow never though I'd say that). heat, but route it in front of the turbo! If you have any questions, or need more details, feel free to contact me.